I'd like to backup the entire D drive using File and Folder backup option, but to exclude several sub folders from it, yet I'm unable to do so. In "1. 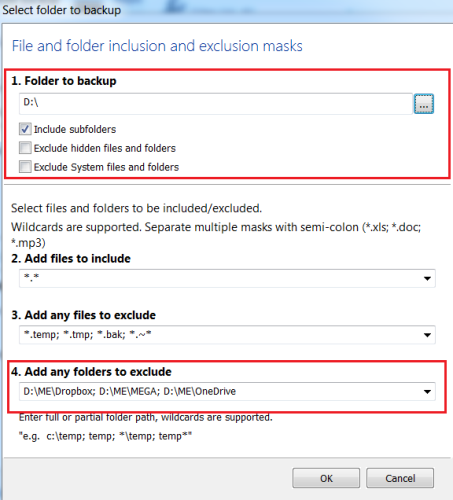 Folder to backup" dialog box I set D:\ drive as a folder to be backed up and in "4. Add any folders to exclude" dialog box I specified "D:\ME\Dropbox; D:\ME\MEGA; D:\ME\OneDrive" (tried with and without the quotes) folders to be excluded from the backup. Each time I get all three folders backed up. I don't want to use the Image or Clone option nor to edit the windows registry as per this tutorial. I'm new to this program so any help on this matter would be much appreciated. Odd that it's not working, because I set up the exact same thing of backing up an entire partition via F&F backup (in my case, so that custom NTFS permissions can be restored via a wizard interface for the benefit of my client), and it's working fine. I've posted a screenshot of my own configuration below. Incidentally you might want to consider adding the System Volume Information and Recycle Bin folders to your exclusions, otherwise weird things might happen if you ever tried to select the entire restore for backup. And in the meantime, under certain circumstances both of those folders can become quite large anyway, so you may be unnecessarily inflating the size of your backups. Thanks for your quick response. I have opened a support ticket. If you add the exclusions now, backups going forward will not include them, even if they change on the source — and if you restore from those future backups later, those folders will not be restored, which means the current versions on the target won’t be overwritten by anything from the backup you’re restoring. That’s generally good for the folders I mentioned above. 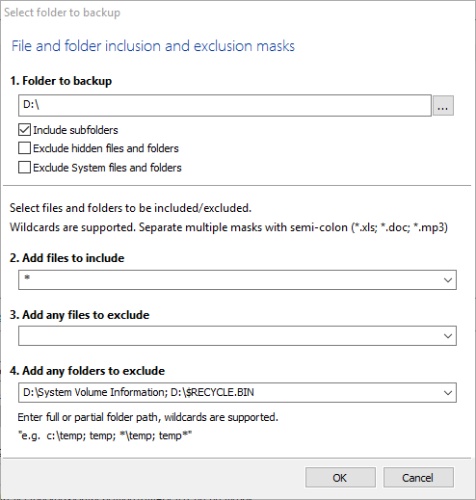 However, excluding those folders will not retroactively delete anything from existing backups.